Andrew Tyler Hansbrough (born November 3, 1985) is an American professional basketball player who last played for the Charlotte Hornets of the National Basketball Association (NBA). The most decorated and honored player in North Carolina Tar Heels history, Hansbrough was the first player in ACC history to not only be named First Team All-ACC four times, but to also be named to a First Team All-American squad in each of his four seasons. He was also named ACC Rookie of the Year in 2006 and ACC Player of the Year in 2008, while sweeping all national player of the year awards that year as well. Following his college career, he was selected by the Indiana Pacers with the 13th overall pick in the 2009 NBA draft. He played four seasons for the Pacers before joining the Toronto Raptors in 2013. After two seasons with the Raptors, he joined the Charlotte Hornets for the 2015–16 season. Hansbrough attended Poplar Bluff High School in Poplar Bluff, Missouri, where he led the Mules to back-to-back state championships and scored more than 2,500 career points. He had 29 points, 16 rebounds and two blocks in a 72–56 win over Vashon High in the state Class 5 championship game on March 12, 2005, ending the opposition's 60-game win streak. He averaged 28.2 points and 13.4 rebounds as a senior. In addition being named Gatorade Player of the Year in Missouri, he was named a McDonald's and Parade All-America. He had 15 points and eight rebounds in the McDonald's All-America game, and had 24 points and nine rebounds and was named co-MVP of the Jordan Brand Classic. As a freshman at North Carolina in 2005–06, Hansbrough became the only player in ACC history to earn First Team All-America honors as a freshman. He was honored so by The Sporting News and Rupp, and was named third-team All-America by the Associated Press, NABC and Basketball Times. He was only the third ACC freshman to earn AP All-America honors, joining Kenny Anderson and Stephon Marbury of Georgia Tech. He was selected the National Freshman of the Year by USBWA, ESPN.com, The Sporting News and Basketball Times, and earned unanimous selection as the ACC Rookie of the Year and was the first freshman to earn unanimous first-team All-ACC honors in league history. Hansbrough had the highest scoring average ever by a Tar Heel freshman at 18.9 per game, good for second in the ACC in scoring. He also led the ACC in offensive rebounds (3.58 per game). He became the first Tar Heel freshman to lead the team in scoring and rebounding, and was the first Tar Heel (and seventh ACC player) to lead his team in scoring, rebounding, field goal percentage and steals in the same season. Hansbrough's best game as a freshman came on February 15, 2006, when he scored 40 points in a home game against Georgia Tech. 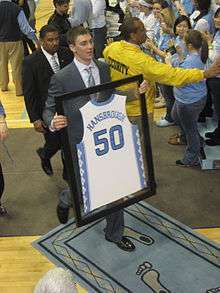 Hansbrough set the Dean Smith Center scoring record, as well as the ACC's freshman scoring record. Hansbrough broke the program's freshman mark of 31 points, and broke Joseph Forte's arena record of 38 points set in 2000–01. Hansbrough surpassed the previous ACC freshman mark of 38 points by Clemson's Skip Wise in November 1974, and became just the eighth Tar Heel to score at least 40 in a game. 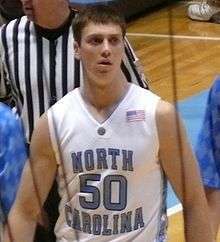 A consensus first-team All-American as a sophomore in 2006–07, Hansbrough was voted UNC's Most Valuable Player by his teammates and coaches. He was a unanimous first-team All-ACC selection for the second consecutive year and led UNC (fourth in the ACC) in scoring with an average of 18.4 points per game. He led the team and was second in the ACC in rebounds (7.9 per game) and grabbed double figures in rebounds 11 times. He was sixth in the ACC in field goal percentage and ninth in free throw percentage, and was one of three players (along with Florida State's Al Thornton and BC's Jared Dudley) to rank in the Top 10 in both field goal and free throw accuracy. On March 4, 2007, Hansbrough had 26 points and 17 rebounds before suffering an injury that looked worse than it really was in the closing seconds of the Tar Heels' 86–72 win over Duke, clinching the top seed in the Atlantic Coast Conference tournament. With 14.5 seconds left in the game, Hansbrough leaped for a layup. After the ball left his hand, he was struck in the face by Gerald Henderson's right elbow. The errant elbow broke Hansbrough's nose. Henderson was ejected from the game and received an automatic one-game suspension from the NCAA. Hansbrough went on to play with a nose-guard/face mask through the postseason, before taking it off in the second half of a game against Michigan State, in the second round of the 2007 NCAA tournament. Hansbrough was the Tar Heels' co-MVP with Ty Lawson as a senior in 2008–09. He finished third in the ACC Player of the Year balloting behind Lawson and Florida State's Toney Douglas, after finishing the year second in the ACC in scoring at 20.7 points per game and sixth in field goal percentage, free throw percentage and rebounding. He made a career-best 28 straight free throws early in the season and shot a career-best 84.1 percent from the free throw line, improving his free throw accuracy for a third straight season. He scored 18 points in each of North Carolina's Final Four wins against Villanova and Michigan State and was subsequently named to the All-Final Four team. Hansbrough became the first player in ACC history to earn first-team All-America and first-team All-ACC honors in each of his four seasons. He was one of only three ACC players (with Lawson and Jeff Teague) to be a USBWA Player of the Year finalist and on the Naismith and Wooden mid-season lists. He also became the fifth player in ACC history to lead his school in scoring in four straight seasons (with Virginia's Jeff Lamp 1978–81, Georgia Tech's Mark Price 1983–86, Duke's Johnny Dawkins 1983–86, and Clemson's Greg Buckner 1995–98). Hansbrough finished his career with a league-record 2,872 points and a school-record 1,219 rebounds to go with the NCAA record of 982 made free throws. On June 25, 2009, Hansbrough was selected by the Indiana Pacers with the 13th overall pick in the 2009 NBA draft. After missing all of training camp, the preseason and the first four games of the regular season with an injury to his shin, he made his NBA debut against the Washington Wizards on November 6, 2009. He tallied 13 points against Washington, including 7-of-10 from the foul line. At the time, he was just the second Indiana player to have attempted 10 or more free throws in a game. After averaging 3.8 rebounds per game in his first 14 appearances, he led the Pacers with 11 rebounds against the Portland Trail Blazers on December 9. In that game, he gathered a season-high seven offensive rebounds, tying Roy Hibbert for second most by any Indiana player in 2009–10. On December 11, he scored a season-high 21 points against the New Jersey Nets. On December 27, he made and attempted 10 free throws against the Miami Heat, becoming the first player in Pacers' history to record a double-double (10 points, 10 rebounds) without making a field goal. His final game of the season came on January 16, 2010, as he sat out 49 of the season's final 53 games with an inner ear infection. Hansbrough appeared in 22 of the team's first 32 games in 2010–11, averaging 5.0 points and 3.3 rebounds in 12.9 minutes per game. From that point on, he averaged 13.7 points, 6.1 rebounds and 26.1 minutes per game in 48 appearances, 29 of which were starts. His 23rd game of the season came on January 7, 2011 against the San Antonio Spurs. He made his second career start (his first of the season) and scored a game-high 23 points with 12 rebounds. Hansbrough started at power forward with the Pacers trying to move to a smaller lineup. He also had two blocked shots and finished 10-of-10 from the field. He topped that performance on January 23, leading the Pacers with a then career-high 27 points and 10 rebounds in a loss to the Denver Nuggets. On March 15, 2011, Hansbrough posted a career-high for the second game in a row against the New York Knicks. After scoring 29 points on March 13, he a 30-point effort two nights to help the Pacers claim back-to-back wins against the Knicks. In 70 regular season games for the Pacers in 2010–11, Hansbrough made a career-high 29 starts and averaged career-high numbers in points (11.0), rebounds (5.2) and minutes (21.9). He also made his playoff debut for the Pacers in 2011, appearing in all five of the team's first-round playoff games against the Chicago Bulls, a series the Pacers lost 4–1. In Game 1 of the series, Hansbrough scored 22 points, and in Game 5, he recorded 14 points and 11 rebounds. In the lockout-shortened 2011–12 season, Hansbrough was the only Indiana player to log 1,000+ minutes without a start. He played in all 66 games and averaged 9.3 points, 4.4 rebounds and 21.8 minutes per game. Though his rebounding average ranked fifth on the team, he was third with 113 offensive rebounds. He averaged 1.77 orpg and had three or more 16 times. Hansbrough collected a season-high 13 rebounds in the season-opener against the Detroit Pistons on December 26, with five of those coming at the offensive end. He had 10+ rebounds twice in the season's first three contests, but those were his only games in double figures, until having 10 boards against the Houston Rockets on April 1, 2012. He was second on the team with 226 free throws made and 278 attempts from the foul line. He attempted 10+ free throws three times, including a high of 11 against the Miami Heat on January 4. He scored at least eight points in each of the season's first 11 games, hitting double-digits in nine of those. In that 11-game span, he averaged 12.2 points per game and had a streak of seven games in a row with 10+ points from December 30 to January 9. He scored in double figures just 20 times the rest of the season, including a season-best 22 points against the Charlotte Bobcats on February 22. The Pacers made it to the second round of the playoffs in 2012, where they were defeated by the eventual champion Miami Heat. In 2012–13, Hansbrough played in a career-high 81 games, averaging 7.0 points, 4.6 rebounds and 16.7 minutes per game. He started eight contests where he averaged 14.8 points, 10.1 rebounds and 26.8 minutes. He scored in double figures 21 times, had 10+ rebounds eight times, and recorded six double-doubles, with five of his double-doubles coming in his eight starts. He grabbed a career-high 161 offensive rebounds during the season, with at least four boards on the offensive end 13 times. On March 19, 2013, Hansbrough had a career-high nine offensive rebounds against the Orlando Magic. Three days later, he recorded a season-best 22 points and 12 boards against the Milwaukee Bucks. The Pacers' 2013 playoff run saw them reach the Eastern Conference Finals, where they were once again defeated by the Miami Heat. Hansbrough played in a career-best 19 playoff games, averaging 4.1 points, 3.2 rebounds and 12.7 minutes. He scored a 2013 playoff high of 10 points in Game 3 against Miami on May 22. In 2013–14, Hansbrough scored 10+ points six times, with one 20-point game. He grabbed 10+ rebounds on four occasions and led the team on the glass seven times. He averaged 4.0 points, 6.8 rebounds and 25.5 minutes in four games as a starter. In the Raptors' seventh game of the season on November 9, Hansbrough scored a season-high 23 points against the Utah Jazz. He made his fourth start on March 19 against the New Orleans Pelicans and grabbed a season-high 13 rebounds; and recorded his only double-double (12 points & 11 rebounds) of the season on April 14 against the Milwaukee Bucks. Between January 3 and January 27, Hansbrough was inactive for 14 straight games due to a sprained left ankle. He had missed two games in December as well with a sprained left shoulder. In 2014–15, Hansbrough played in 74 games for the Raptors and averaged 3.6 points and 3.6 rebounds in 14.3 minutes, while shooting a career-high .521 from the field (86-165). On March 22, 2015, he set a season high with 18 points in a 106–89 win over the New York Knicks. On April 4, 2015, he was given the starting power forward role and remained there for the rest of the regular season and into the playoffs. Against the Boston Celtics on April 4, he again scored 18 points. He scored in double figures in the following two games as well, which marked his best stretch of the season. On July 22, 2015, Hansbrough signed a one-year deal with the Charlotte Hornets. He went on to have a career-worst season in 2015–16, averaging just 2.4 points and 2.0 rebounds in 7.8 minutes per game over 44 contests. He spent most of November and December serving as depth on the Hornets bench, before injuries to both Al Jefferson and Cody Zeller in January helped open up some minutes in the frontcourt for Hansbrough. He took advantage of this opportunity with his best performance of the year in a road game against the Portland Trail Blazers on January 29. He poured in a season-high 12 points and a career-high-tying 14 rebounds, the latter of which also tied for the highest total by any Hornets player in a single game in 2015–16. Hansbrough played in 12 total games in January, averaging 3.0 points, 3.8 rebounds and 0.7 steals in 13.4 minutes. However, he quickly saw his minutes dwindle with the roster getting healthier as the year continued to unfold. He averaged 1.9 points and 0.9 rebounds in 4.6 minutes in 16 total games from the start of February until the end of the regular season. Hansbrough and his two brothers, Greg and Ben, have always been close. They formed a special bond when big brother Greg had a brain tumor removed at age eight. Greg, despite being told he'd never play organized sports, became the captain of his high school cross-country team, lettered in basketball and by 2011, he had run three marathons and 13 half-marathons. Ben played college basketball for Mississippi State and Notre Dame before playing in the NBA for the Indiana Pacers alongside Tyler in 2012–13. ↑ Austin, Earl, Jr. (March 17, 2005). "Vashon beat by Shaq of Poplar Bluff". stlamerican.com. Retrieved October 9, 2016. 1 2 3 4 5 6 7 8 9 10 11 12 13 "Tyler Hansbrough". NBA.com. Retrieved October 9, 2016. ↑ "Hansbrough Named First-Team All-America by Rupp Award". GoHeels.com. March 23, 2006. Retrieved October 9, 2016. ↑ "Redick tops ACC again". starnewsonline.com. March 8, 2006. Retrieved October 9, 2016. ↑ "Hansbrough's Big Night Leads Heels Past Georgia Tech". GoHeels.com. February 15, 2006. Retrieved October 9, 2016. ↑ "UNC clinches top ACC seed; Williams gets 100th win at school". ESPN.com. March 4, 2007. Retrieved October 9, 2016. ↑ "Tyler Hansbrough of North Carolina unanimous all-ACC for third time". ESPN.com. March 10, 2008. Retrieved October 9, 2016. ↑ "2007–08 Tar Heel Basketball Weekly Release" (PDF). grfx.cstv.com. p. 8. Retrieved October 9, 2016. ↑ "Carolina Basketball: Tyler Hansbrough Game Winner vs. VT in 2008 ACC Tournament". YouTube.com. March 12, 2015. Retrieved October 9, 2016. ↑ "Hansbrough sets career scoring record in UNC win vs. Evansville". ESPN.com. December 18, 2008. Retrieved October 9, 2016. ↑ "February Tar Heel History". tarheeltimes.com. Retrieved October 9, 2016. 1 2 McCreary, Joedy (February 10, 2010). "UNC retires Hansbrough's No. 50". sandiegouniontribune.com. Retrieved October 9, 2016. ↑ "Hansbrough Wins Wooden Award, Sweeping Major Individual Honors". GoHeels.com. April 12, 2008. Retrieved October 9, 2016. ↑ "Spurs-Pacers notebook". NBA.com. January 7, 2011. Retrieved October 9, 2016. ↑ "Pacers-Nuggets notebook". NBA.com. January 23, 2011. Retrieved October 9, 2016. ↑ "Knicks-Pacers notebook". NBA.com. March 15, 2011. Retrieved October 9, 2016. ↑ "Tyler Hansbrough 2010-11 Game Log". Basketball-Reference.com. Retrieved October 9, 2016. ↑ "Offer on table to Tyler Hansbrough". ESPN.com. July 1, 2013. Retrieved October 9, 2016. Before free agency opened Monday, the Pacers opted to make the offer to Hansbrough. ↑ Lewis, Tom (July 2, 2013). "Stein: Tyler Hansbrough an unrestricted free agent after Pacers rescind offer". indycornrows.com. Retrieved October 9, 2016. ↑ "Raptors Sign Tyler Hansbrough". blog.raptors.com. July 15, 2013. Retrieved October 9, 2016. ↑ "Tyler Hansbrough 2013-14 Game Log". Basketball-Reference.com. Retrieved October 9, 2016. ↑ "DeRozan scores 23, Raptors rout Knicks 106-89". NBA.com. March 22, 2015. Retrieved October 9, 2016. ↑ "Tyler Hansbrough 2014-15 Game Log". Basketball-Reference.com. Retrieved October 9, 2016. ↑ "Hornets Sign Free Agent Forward Tyler Hansbrough". NBA.com. July 22, 2015. Retrieved July 22, 2015. ↑ Perley, Sam (June 6, 2016). "2015-16 Season in Review | Tyler Hansbrough". NBA.com. Retrieved October 9, 2016. ↑ Zarum, Dave (November 27, 2014). "Hard Foul: The Tyler Hansbrough Story". SportsNet.ca. Retrieved October 9, 2016. ↑ Pickeral, Robbi (September 12, 2012). "Tami Hansbrough resigns at UNC". ESPN.com. Retrieved October 9, 2016. ↑ Seely, Mike (September 1, 2004). "Tallboys". riverfronttimes.com. Retrieved October 9, 2016. ↑ Hampton, Angela (April 3, 2009). "TYLER HANSBROUGH THROUGH HIS MOTHER'S EYES". ABC11.com. Retrieved October 9, 2016. ↑ Thamel, Pete (February 17, 2011). "For Notre Dame's Hansbrough, Competitiveness Is a Family Trait". NYTimes.com. Retrieved October 9, 2016.